She has been reading (among other good things, which you can discover here) Blanche Howard’s posthumously published The Ice Maiden (available in e-copy via Bev Editions). Imagine travelling halfway around the globe and meeting up with a person having the same name as the protagonist in a book you wrote and are there to publicize. That is the situation Connie Brewster faces when she goes to England to attend a literary awards gala in London’s Guildhall. Howard’s latest is a cornucopia of titles and names and resources representing alternate realities. This theme of alternate realities and reality versus fiction will appear several times in the book and is always thought-provoking given the particular situation . The writing process itself is a major undercurrent in the book. In the first chapter Connie is reminded by her own behaviour of some writerly advice she was given long ago: NEVER TRASH YOUR OWN WORK. The writing process and the personal connection to that process is deftly handled by Howard through the insertion of appropriate sections from Connie’s published book into this book by Blanche Howard which we are reading. This intricate weaving of themes and the movement between the two novels and life is not always apparent on the first reading (and not seeing it does not detract from the reading at all) but makes itself clearer in a second reading and feels like a series of epiphanies or firecracker showers in the brain. It is because of her writing career that Connie and her family are in England. It is partly because of a mention in her book of the Alberta tar sands project but also because Graham works for oil interests that two things happen to Connie, one known and exhilarating and one unknown and life-altering. Relationships are the most interesting aspect of this novel for me and there are a plethora of them to consider as you might expect: Connie and her husband Graham (8 years older); Connie and Graham and their adult children Percy (Persephone) and Eliot (named after T.S. ); Connie and her mother Cora; Connie and her agent Lucille Goodwin;Graham and Lucille; Graham and Cora; Graham and Hermione Fancourt (a biographer and an environmentalist) who introduces herself as “born a muggle [but] Hogwarts changed that.”; Connie and Peter Vancleigh (also a writer and a “Sir” and a homosexual); Connie and Angus. J. Watson (a person with the same name as the protagonist of Connie’s book). All of these relationships are interesting and fraught with tension either for those inside the relationship or for those close to the persons or both! From the beginning, when Graham forgets to include Lucille in Connie’s thank you speech at an award ceremony, to the end when he withholds a royalty cheque left by Lucille for Connie, we sense Connie’s unrest. When Graham thinks Hermione desires him and finds out that she wants to discuss Jevons Paradox and relate it to his employment by and support of Big Oil, we feel relieved. This is another seamless connection with the environmental topics included in both Connie’s novel and Howard’s novel. Hermione has asthma and is particularly interested in deteriorating air quality! There are two minor threads in the novel which are of more than passing interest. The environmental issue is connected with Graham as indicated above. The second interesting minor thread is that of native heritage and identity which is confined to Connie’s novel but a connection can be drawn with Connie’s personal struggle to possess her own self. This last book by Blanche Howard is a reader’s feast, so rich in so many ways. There are allusions galore: artistic, geographic, historical, literary, mythical, and political. Beginning with Persephone and Cora as characters and a gathering at London’s Guildhall then continuing with writers such as Mordecai Richler, Margaret Atwood, Alice Munro, Patrick White, A.S. Byatt and Charles Dickens. The list goes on to include T. S. Eliot, Jackson Pollock, William James, Colm Toibin, Pat Barker, Marion Engel, John D. Rockefeller, Dylan Thomas, Ian McEwan, Scott and Zelda Fitzgerald and the Mona Lisa! These references alone provide readers great pleasure by acting as a wonderful reminder of pages and people to revisit. A rich posthumous gift which will be read again many times by this reader. Have you read Blanche Howard’s writing previously? Does this sound like a novel that belongs on your TBR? You are definitely right, Karen, that it could be a dangerous book to read but the reminders are gentle and that relieves the pressure considerably! My sincere apologies for taking so long to reply: I wish I could say that I was buried under all those literary allusions. That would be partially true but I was also out and about in realms other than literary. The literary allusions are slipped in such as when Connie wonders “if anyone in this literate society had heard of CanLit, but they must have, Canadian writers had won the Booker, Margaret Atwood, Alice Munro.” And on looking over the crowd at the awards ceremony, she spots Stephen Major, Patrick White and Peter Carey. Then her agent meets A.S. Byatt and so it goes. There is much more pressure to go searching for actual titles while reading A Memoir of Friendship and the passion and excitement of both women for what they are reading is definitely addictive. 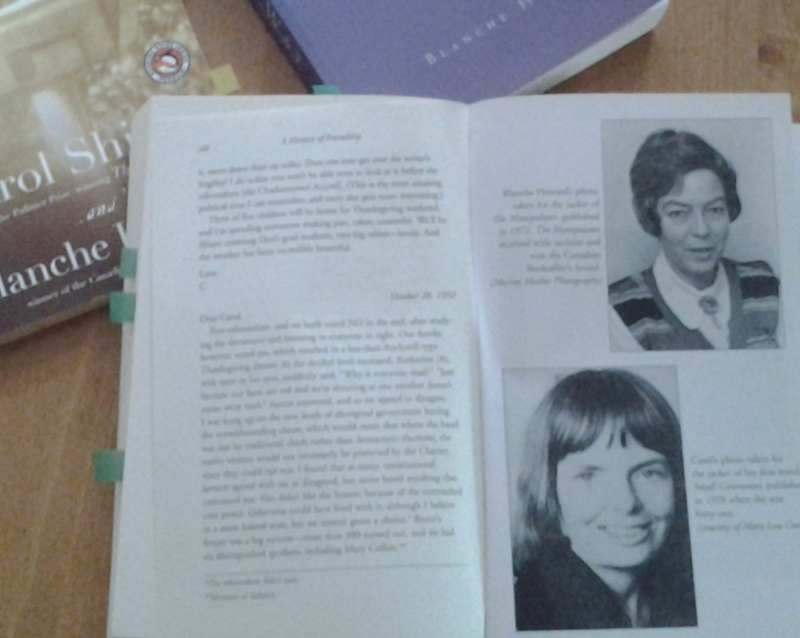 Ideally, the Memoir is a book one wants to reserve for a time when one needs to be immersed in a literary haven and has time to read or reread some of the work of both Carol Shields and Blanche Howard. But snippets here and there will do until one gets that kind of time. If you should try any of Blanche Howard’s work I hope it brings pleasure. This could be a dangerous book to read! All those references to other authors would have me scurrying to the bookshop or library determined to start reading these people right away.